At school we have one day to prepare for Mother's Day because it occurs so close to the end of the year. Even though, I buy new books about mothers every year because I think they are so cute. Of course, I have my favorite I usually read to the children every year, but I thought I would sit down with the other books and take a look at them and share them with you. I figured I would start with my favorite. 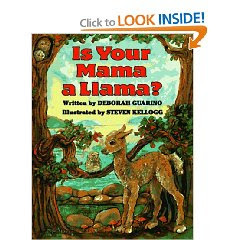 "Is Your Mama a Llama?," by Deborah Guarino, illustrated by Steven Kellogg. This is a story of a little llama that goes around asking her friends if their Mama is a llama. It has great rhyming text with a cute storyline. We play guessing games with this book as the friend will give clues as to what their Mama is and the answer is on the next page. 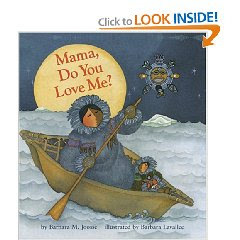 Another favorite I have read is "Mama, Do You Love Me?," by Barbara M. Joose, illustrated by Barbara Lavalle. This is a wonderful story of a little Eskimo that asks her mom if she will always love her. The little girl keeps coming up with quite imaginative scenarios to see if her Mama will always love her. 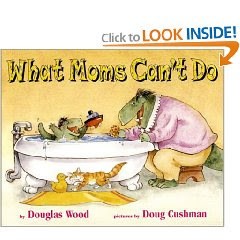 A book I just read that I thought was hilarious is "What Moms Can't Do," by Douglas Wood, illustrated by Doug Cushman. This book was great. I laughed all the way through. I'm not quite sure if the children will get it though. If you ever see this book, take a minute and read it. 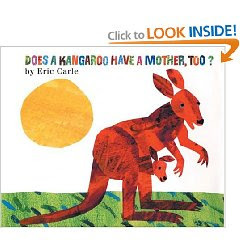 Today I read "Does a Kangaroo Have a Mother, Too?," by Eric Carle. We had a blast with this book. It is full of animal mothers and their babies. We had a great time acting out all the different animals in this book. Always fun with Eric Carle. 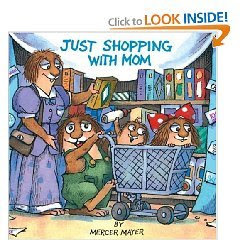 Two good books by Mercer Mayer are, "Just For You" and "Just Shopping With Mom." 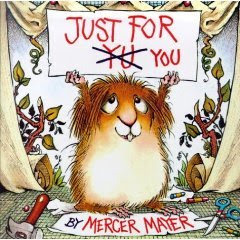 Mr, Mayer always has such a fun way with his writing and those little ones just do all they can to help mom and make her day. "Mother May I?," by Grace Maccarone, illustrated by Melissa Sweet is a cute story of all the wonderful questions Moms get when they are out and about. It has a very sweet ending. 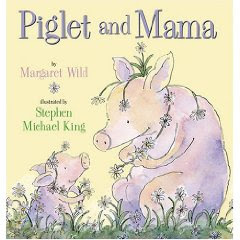 "Piglet and Mama," by Margaret Wild, illustrated by Stephen Michale King is a cute story of a piglet looking for his mom. As her travels the barnyard all the animals want him to join them in fun, but piglet just wants Mama. When piglet finds her wonderful things happen. 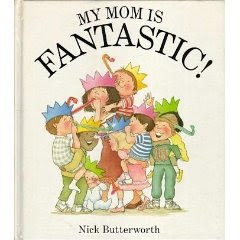 "My Mom is Fantastic," by Nick Butterworth is a cute short story of the fun things moms can do. 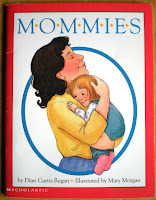 "Mommies," by Dian Curtis Regan, illustrated by Mary Morgan is another of those great stories listing the great talents of all moms. 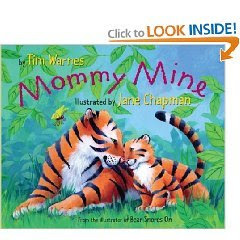 "Mommy Mine," by Tim Warnes, illustrated by Jane Chapman is a great story that reminds me of "Dinosaur Roar," by Paul and Henrietta Stickland. It is a story of jungle moms and their young and concentrates on traits of the animals. It's really adorable and it doesn't hurt having great illustrations by Jane Chapman. 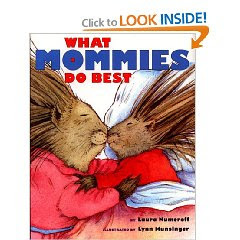 Another fun book is "What Mommies Do Best," by Laura Numeroff, illustrated by Lynn Munsinger. This book speaks of all the wonderful talents of mom. The great thing is, you flip the book over and on the other side is "What Daddies Do Best." It has the same text as mommies, but different pictures. The last book I read today was a bit different. 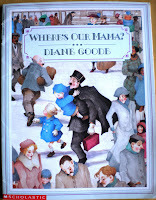 The book is called "Where's Our Mama?," by Diane Goode. It is really a cute story about two little children that engage the help of a gendarme(?, new word for me) to find their mom while they are at a train station. It has adorable pictures and portrays the thoughts of little ones adorably. I hope you enjoy some of these books with your little one on Mother's Day. Thanks for all the great book suggestions!